Car Clips are now included with all Rightline Gear Car Top Carriers. These Replacement Car Clips can be purchased separately to replace lost car clips or to be added to the attachment straps of any previously purchased Carrier. The attachment straps on previous Rightline Gear Car Top Carriers are long and have (2) loop-ends. (Fig 1). The attachment straps on current Rightline Gear Car Top Carriers are shorter and have only (1) loop-end. (Fig 2). Place one strap buckle-side down (Fig 3). Run the strap’s loop-end (without twisting the strap) through the back side of a Car Clip (Fig 4). Run the opposite end of the strap through this loop-end (Fig 5 and Fig 6). 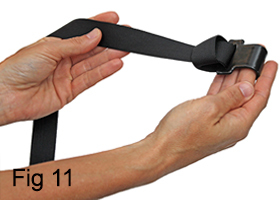 Continue to pull the strap so that it tightens around the Car Clip (Fig 7). Repeat these steps for the opposite end of the same strap. The Car Clips should face each other when the strap is laid over the carrier (Fig 8). Repeat all steps for the second strap. Follow these instructions to replace lost Car Clips or to re-connect the included Car Clips to the attachment straps. Run a strap’s loop through the backside of a Car Clip (Fig 9). Thread the strap’s end through its loop (Fig 10). Pull the strap’s end to tighten the strap around the Car Clip (Fig 11). Repeat these steps for the other (3) straps. The Car Clips attach under the vehicle’s door frame weather molding (Fig 12). The straps tighten over the top of the cargo bag (previous Carriers) or attach to buckles in each of the (4) corners of the Carriers (current Carriers). The tension of the straps pulled against the Car Clips holds the cargo bag in place. If a 4-door vehicle, (1) strap will attach to the door frame weather molding in each of the (4) doors. If a 2-door vehicle, (2) straps will attach to the door frame weather molding in each of the (2) doors. Close the vehicle’s doors over the clips/straps (Fig 13). Please see the set up guide included with each carrier for additional instructions.